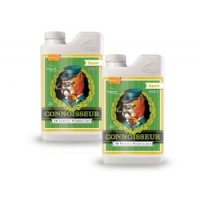 Advanced Nutrients Connoisseur Grow is the highest quality 2-part bloom nutrient you can buy. When you perfected the art of indoor growing, and got all your environmental factors bang on, Connoisseur will allow you to reach that last step for maximum crop size and quality. Connoisseur Grow is 5-in-1 product. It contains an organic “wetting” agent to allow easier spreading and uptake of nutrients by roots. 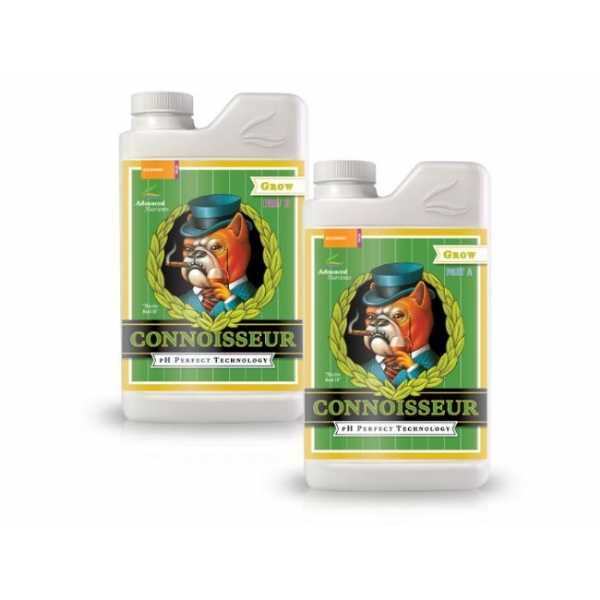 Connoisseur Grow also contains humic and fulvic acids for better nutrient absorption and transport around the plant. Finally, it contains a whole range of amino acids which are the building blocks of proteins that enhance growth, hormone production and essential oil production. The ingredients are all the finest possible, which accounts for the premium price of this product. The research that has gone into it is second to none. Moreover, Connoisseur Grow is now an extremely appealing product to both new growers and more experienced ones due to it’s “pH perfect” properties. Infact, Connoisseur Grow automatically adjusts the pH of your nutrient solution to the perfect level and then keeps it stable! There's no need to mess around with dangerous acids or alkalis, and you can leave your pH meter at home! The saving in time and hassle that this brings is considerable and makes it the easiest-to-use 2-part nutrient available. The only thing you have to remember is that for the “pH perfect” technology to work, only Advanced Nutrients boosters and additives should be added to the reservoir. Using products made by other manufacturers may stop the pH perfect technology from working. Works with ALL hydroponics, soil or sphagnum growing mediums and all hydroponics, aeroponics, drip irrigation, NFT, ebb and flow and continuous liquid feed growing systems. Use 4 ml per litre during the vegetative phase.